“This paper has approached progressivity from different angles. Bringing together our findings, we can conclude strongly that progressivity has decreased over the last few decades, a finding that is robust to the choice of measure. We also conclude, but with less certainty, that the reduction in progressivity appears not to have given growth a boost. While this paper focused on personal income taxes, developments in capital income taxation are also likely to have contributed to reducing overall progressivity: Capital income is distributed more unequally than labor income, has risen over the past few decades as a share of total income (IMF, 2017b), and is often taxed at a lower rate than labor income. The corporate income tax, in particular, plays an important role in determining progressivity. First, there can be a direct effect to the extent that it is partly borne by owners of corporations. Second, it indirectly supports the enforcement of the taxation of labor income: Corporate taxation mitigates arbitrage in response to taxation of entrepreneurial income, because distinguishing labor income from capital income can be difficult (or impossible) when individuals can freely choose the form through which they declare their income (IMF, 2014). When the personal income tax base can be shifted to some alternative tax base that is taxed at a lower rate (such as corporate income), optimal tax theory implies that the optimal tax rate on personal income rises with the tax rate on the alternative base. In recent decades, international tax competition—resulting from capital mobility—has led to a steady downward trend in corporate income tax rates (Table 2). 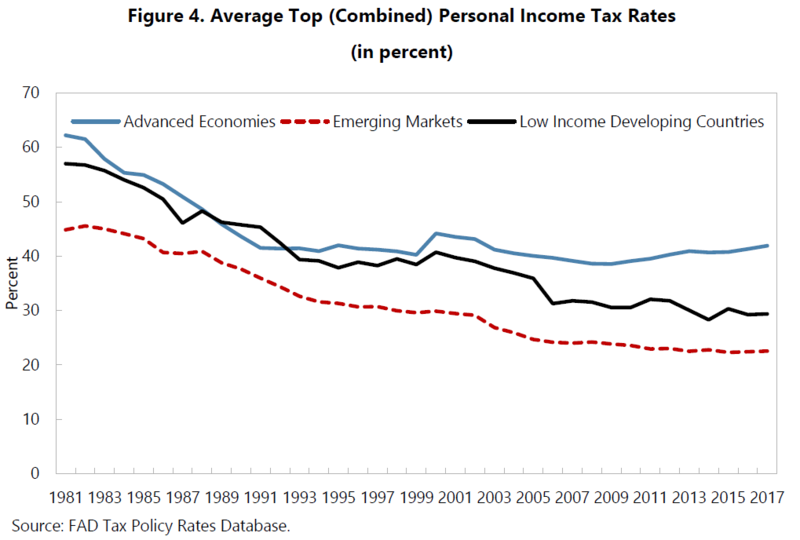 This trend reduces overall tax progressivity and may also put downward pressure on personal income tax rates—even though labor itself is less mobile and could be taxed more easily in a globalized world. There are many unresolved questions and areas for further research. For example, progressivity measures taking the entire tax and benefit system, and ideally even public spending, into account would enhance the understanding of overall progressivity tremendously. The challenges in finding such a measure, especially one that is still independent of pre-tax and spending distributions are enormous.